The Celtic tree ogham is a mnemonic device and magical system used as a divination method. Ogham and its use is mentioned in many Celtic myths and folktales. The ogham represents a map to lead us through an evolutionary spiral up and around the World Tree, from birth to death and beyond, or on a smaller scale, through the process of manifestation for all creative projects and processes. Ogham staves becomes an embodiment of the tree’s particular energy and spirit. The ogham thus becomes an ally in divination, contemplation, and magic. Ogham can be used for divination in various ways. Ogham staves can be drawn at random from a bag and cast upon a cloth for “open” divination methods, or they can be chosen at random and placed in a sequence or pattern for interpretation in relation to their position. Working effectively with the ogham relies on a closely built relationship with the trees and their spirits. 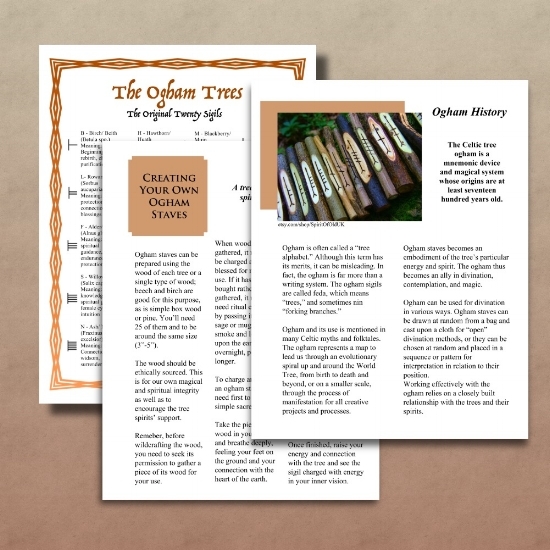 You'll find more information on Ogham Staves, a reference guide to Ogham Staves and Midsummer magick in our June 2018 edition of Witchology Magazine! Forest, Danu. Celtic Tree Magic: Ogham Lore and Druid Mysteries . Llewellyn Worldwide.